This entry was posted in Wordful Wednesday, Wordless Wednesday and tagged big bang theory, Blackspot, Fun, glasses, hops, kitty, linky, purr, Wordful Wednesday, Wordless Wednesday by StacyUncorked. Bookmark the permalink. 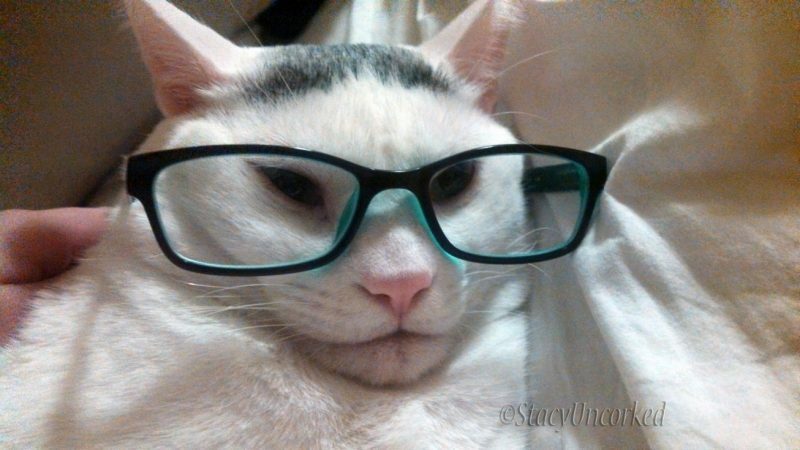 Kitty looks so cute in glasses. P.s does your cat go outside? I have a cat now! Someone dumped a not fully grown cat out here in the desert. We found her last week as we were heading downtown. She was alone and scared. She has found a home with us. I’ll be sharing her picture next week. A little while ago, she caught one of our ground squirrels and toyed with him so much that he got away. Silly cat! I swear your linky does not like me…. your kitty is just too smart for me too! Sheesh Everyone is ganging up on me over here! ~snicker-snicker~ (cute poem too)! the poem is perfect! such a smart kitty!